The Switch/Swiwi 180 keyboard is a 65% layout with dedicated arrow keys and a separated function cluster. The design is inspired by the larger 1800 layout. Too many 65% layouts are just a regular rectangle so I am hoping this is a step away from that for once. The design started as almost a 40% with stuff tagged onto it but for the sake of keycap support and usability it was enlarged. Spaghetti Routing.. I tried to do this at 3AM and wasn't fully using my brain. Second Iteration, a bit better but after a bit of brainstorming and rearranging the pinout I got it to a better place. Would love to hear feedback and suggestions, tell me if this is something you'd use or find interesting.. or tell me why this is the stupidest thing you have ever seen! CURRENT STATE : This round of PCB's is messed up either in design or in manufacturing. I've tried soldering one together and sent one away to someone whose soldering I trust more than my own since it was basically my first time doing SMD; The plan is to use the components and design a small PCB (numpad/macropad) and use the remaining components them to recoup a few of the costs before I do a fixed batch of PCBs. Really like the design but I think it could use a split space option. I know if I ever produce these for the public I will definitely add more layout support and features. Right now my biggest focus is to get something fully functional before I muddle around with other stuff. been thinking about it, very popular layout so might be included.. but I think to switch it up, I'd do all 1u bottom row keys, including the spacebar then also add ortholinear support and then a homerow spacebar as well. I like this layout the most because it forces you to use the home-row the most. I like this! even better than my approach! I love this. Split space is key though. Noted, I realize I probably could easily fit it in I think. Maybe add a HHKB-style bottom row like the Duck Black Bird? seems the general consensus is more bottom row support so this weekend I'll look into the best way to implement multiple bottom row support. very much possible to add a bottom row that supports hhkb style, just might not be 6u (not sure what the blackbird has). I'll try to find something that doesn't look odd. With where you moved the controller to adding more bottom row support should be pretty easy, the only problem you could possibly run in to is some layouts not working with alps. If you have any issues figuring out switch spacing on the bottom row or making the layouts work with both MX and Alps I'd be happy to help. Thanks for the support Joey, As for alps support I am still unsure if I should really keep it since lightcycle (if it hits MOQ) is one of the only sets that would work on the board. Only a few vintage sets have short R-shifts anyways so not sure if it is really worth it . edit: Also switches are in the proper layout now, and spaced out properly so thats good. - Look if I can add a breakout like the GH60 so that if people wanted they could use one of those WS2812 RGB led strips if they so desired. Alpine Winter would fit the PCB as well FYI. Alpine winter would you're right, you would need some extra blanks or something for the right nav cluster part of the board I guess though. I am curious how long it took you to get proficient with KiCAD. I've always used Eagle in the pas as I've done small projects, but when I decided to try my had at a keyboard I learned you cant buy Eagle any more you have to pay for a monthly subscription and the new license is just atrocious. So I downloaded KiCAD and have been playing with it. I've never been good at trace routing so I've always used Eagle's auto-route to get a starting point and then moved things around from there. Wit KiCAD you don't have that because of a legal issue and I've never been able to get FreeRoute to work on my Mac. Is this Altium what you use for pcb designer? 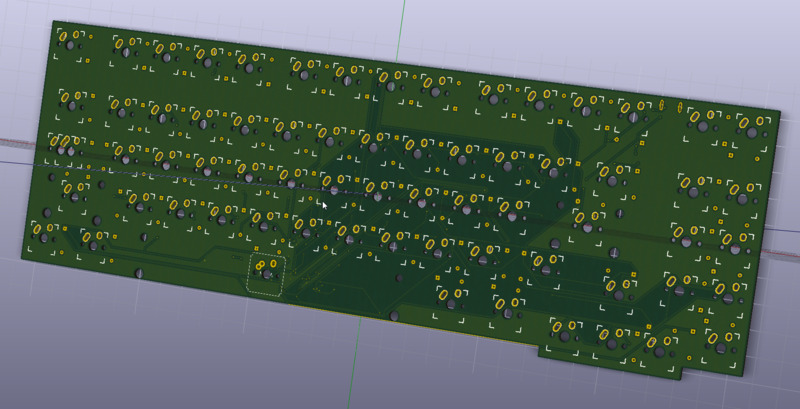 Alright, finished the PCB almost..
Changed the pcb pads to ones that are better for soldering. just have to flip the space bar stabilizer and connect the last remaining pads. but I don't know how to do the indicator circuit so I will look around to see if there is something I can reference later. I have a plate file and pcb model in solidworks for the case design which is the next step. I think I might do an acrylic sandwich style case that I can machine easily for the proto, but also design something cooler for if people are ever interested in something more quality. oooo looking good kiwi, anything on the alps front? Which microcontroller are you planing to use? Maybe you said and I missed it but I skimmed back over and didn't see mention of it. I'm looking at doing something similar but 84key. If you didn't see my concept art render in another thread here is the latest. I'm going to change out the 10 LED layer indicators for a 8x8 SPI module (https://www.adafruit.com/products/959). Just thought I would share my thoughts in case you derive some inspiration from it. I'm pretty interested in seeing how this comes along. I love building keyboards but I don't have anyone to buy them off me when I'm done and I don't need a dozen or more just laying around. That said I've been considering a 60/65 to see what I think as right now I have 2 TKL and one Full sized Razer Blackwidow (with cherry before they made their own switches). Cool Render, that is an interesting layout and the idea of having a LED matrix is pretty interesting. I've been using the atmega 32u4 for my board as its commonly used for custom boards and there is lots of documentation and resources for it. Yea the ATMega32 work nice. I think the Pegasus Hoof has a 32u2 in it. I've not put QMK on there yet just EasyAVR as it was quick and easy. I forget which chip is in the ps2AVRGB I have, it's an Atmel of some sort but I forget which one. I like the keyboard better than my Filco but I hate the layout editor when compared to EasyAVR. I don't know if EasyAVR works on the ps2AVRGB boards or not, I should look into it. Atmega32u4s are great, they're easy to program and pretty hard to kill. While testing my MA42 one of the capacitors was a dud that caused a short to pass way too much current through a few pins but the controller held up without any damage. 32u4 is a good choice.. no complaints here. And I think this layout is original and special enough to warrant the effort and end cost for a milled two piece case in the event of an actual group buy.. even a basic one like that from say an rs78. Do you know the Venus Project?? Want to see with split spacebar and LED matrix! I just want it to build it and then display it. What I'm trying to say is... I like it! Are you planning on doing a GB or just a small run? Either way, I'd like to buy one whenever possible! just curious but I didn't see Home and End key which are both pretty useful, but saw scroll lock key which is totally useless. Are you serious about the 10u support? I'll finally have a keyboard to put my Wyse space bar on!! It was mostly a joke sorry to get your hopes up! That was just a quick mockup done in keyboard layout editor. But like what kinglukas implied the pcb will be fully programmable meaning you can have any key you wish to have bounded. Also I agree with you that I think scroll lock is totally useless as well and ended up taking out the scroll lock indicator on the pcb. There seems like their might be enough interest for a small run or group buy maybe once I finalize some stuff some more I will open up an IC maybe. Right now I am just looking at my different manufacturing options and options for SMD assembly. yyea. due to scroll lock's uselessness, I'd suggest saving that LED for layer lock or something more sensible. Alright, so I have finished touching up the PCB, had some stuff to do irl but got some time to do a bit more. I'm am now looking at pricing and wondering on some input from interested parties on price and what would you think is fair for a pcb. So let you know what you think, I also wanna make it clear no matter what if you want one I wouldn't ask for any money upfront until I have a working product. Just want to hear your opinion if having the smd done by the factory a must for you guys or if you'd trust me to do it. Page created in 0.126 seconds with 71 queries.